Refined carbohydrates are foods that have a high Glycaemic Index (GI). Carbohydrates are mostly found in sugar, sweet foods and grains. High carbohydrate foods include – most types of bread, biscuits, crackers, donuts, muffins, cakes, buns, pastries, soft drinks, regular ice cream, rice, pasta, noodles, most cereals, sweets and lollies. First class protein contains all the essential amino acids and is a complete protein. Protein does not elevate insulin levels. Good quality first class protein is found in seafood, poultry, red and white animal meats, eggs, dairy products and whey protein powder. Vegetarian first class protein can be obtained by combining any 3 of the following 4 food groups at the same time (within the one meal) – legumes (beans, lentils or chickpeas), grains, nuts and seeds. Always include some protein if you eat carbohydrate – this will stabilise your blood sugar levels and minimise hunger attacks. This includes raw fruits and raw vegetables; these foods will improve digestion, liver function and metabolism. This is vital for weight conscious folks, as the liver is the major fat burning organ in the body. If you don’t eat raw vegetables, your liver will not be efficient at burning fat. You may consume an unlimited amount of green leafy vegetables and non-starchy vegetables (such as capsicum, zucchini, broccoli etc). Some herbs and nutrients have been proven to improve glucose and insulin metabolism. They include bitter melon, gymnema, zinc, magnesium, lipoic acid and chromium. They may be taken individually or combined together in some formulas for a synergistic effect. Talk to your Weight Loss Support Consultant or call The Health Advisory Service on 02 4655 8855 to obtain further information. A healthy liver regulates fat metabolism and is the major fat burning organ in the body. Many overweight people have a fatty liver, which does not burn fat efficiently. A fatty liver stores fat, which makes effective weight loss much more difficult. Signs that you may have a fatty liver include – accumulation of fat in the abdominal area, a roll of fat around the upper abdomen (known as a liver roll), abdominal bloating, discomfort over the right upper abdomen, digestive problems, dark circles under the eyes, fatigue, headaches and nausea and finally . . . an inability to lose weight. Consume around 8 – 10 glasses (2 litres) of water each day; this is important as water cleanses the liver and kidneys. First thing in the morning drink a glass of warm water with freshly squeezed lime or lemon juice. This is a “wake up call” for your liver, and gets it burning fat and detoxing your body. Keep a low carb meal replacement like QuickLoss or a protein food handy at all times; this will prevent you from bingeing on fast or sugary junk food. 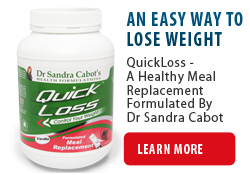 Instead of grabbing junk food – grab QuickLoss and make a healthy shake! As it will be a lonely journey. You will need your weightloss consultant or Dr Cabot’s Health Advisory Service for support along the journey. Make sure you get weighed and measured regularly, as what gets measured gets managed.